Agglomerated cork can be moulded into almost any shape and by using different binders and cork granules, the moulded cork products can have a wide variety or properties, made to be for example heat resistant, soft, hard-wearing or whatever the particular requirement may be. 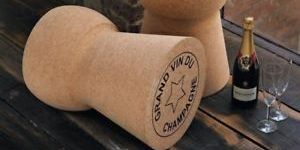 Moulded cork has been used to make a variety of household and industrial objects, sometimes just for the natural beauty and texture that cork provides and at other times for the unique properties that cork can offer. Please contact us if you are interested to find out more about the service that we can provide – we can work from detailed technical drawings or copy existing pieces and we have a very broad range of agglomerated cork textures that we can work with, so that we can produce more or less any moulded cork product that you require, be it cork kitchenware, industrial moulded cork products, sporting cork products or whatever. We are also a cork stools supplier either in standard sizes or to customer specification. We also have available a range of off-the-shelf moulded cork products in stock, such as heat resistant pads, natural cork plant pots, cork boxes and so on. Please contact us if you would like to know if we have the product you require already available.